Caring students show their puppy love. When Northwestern alumna Ali Weinstein found herself with free time the Spring Quarter of her senior year, she decided to foster a dog. Foster owners can provide temporary care for pets that are transitioning between being in shelters and being adopted. Weinstein and her foster dog, Brownie, met in April 2014. She calls the six weeks Brownie spent in her home one of the most wonderful experiences she’s had. Weinstein and her roommate found 5-year-old Brownie through Pets Are Worth Saving (PAWS), Chicago’s largest no-kill organization for homeless pets. Sometimes foster pets have behavioral issues, but Weinstein says she got lucky with her Chow Chow and German Shepherd mix. 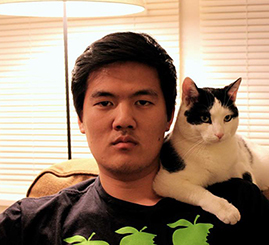 Choi and his foster cat Cubby back in 2013. Photo courtesy of Benison Choi. According to Angela Love, head coordinator of dog fostering at the Evanston-based Community Animal Rescue Effort (CARE), cat fostering is popular with students because roommates can share the responsibility while experiencing a pet-and-owner relationship like the ones they have at home. PAWS and CARE provide all medical supplies and tools necessary. Yes, fostering is free. The process of fostering a dog or cat from CARE is simple. Interested owners just fill out an application and wait for an appointment call. Afterwards, CARE volunteers bring them the animal and medical supplies. CARE marketing and publicity volunteer Karey Uhler describes the match-up process as “eHarmony for pets.” The organization tries to match up owner preferences to an available pet while also considering both parties’ personality traits. At the end of his fostering term, Choi says letting go of Cubby was hard. Because he passed down the cat to current Weinberg seniors Adam Hittle and Robert Smierciak, he keeps in touch with Cubby through frequent Snapchats. Although Weinstein and Brownie’s goodbye was equally sad, it was a little more permanent. She and her roommate were present for Brownie’s official adoption into another loving family a week before their graduation.